My Nanny is Pregnant - What do I do? 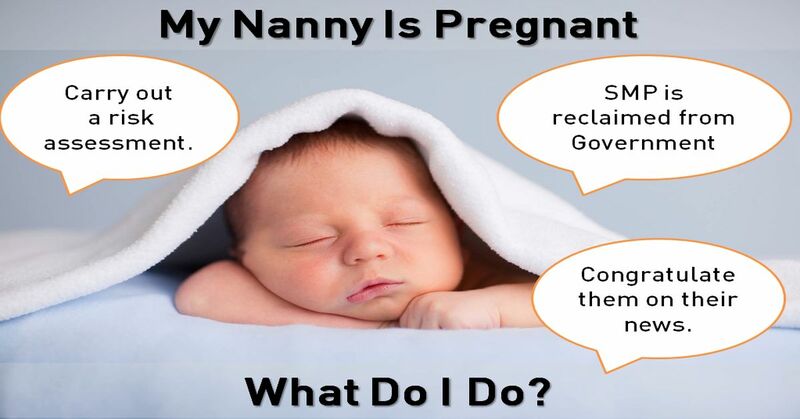 Blog My nanny is pregnant, what do I do? All pregnant employees are entitled to take 52 weeks’ Statutory Maternity Leave around the birth of their child. However, they must meet certain qualifying conditions to receive Statutory Maternity Pay (SMP). As their employer, you pay the SMP but we will reclaim this from the Government for you in advance, provided you give us enough notice of the pregnancy. Otherwise we will reclaim this from the Government as soon as possible. It can take several weeks for this statutory payment to be processed and sent to you. If you decide to employ a maternity cover nanny, we will provide their payslips as part of our original fee, unlike most of our competitors who charge additionally for this. Throughout your nanny’s maternity leave they remain your employee so we will continue to send them payslips and your NannyPaye subscription will continue to be payable. Following her 20 week check, her GP or Midwife will issue her with a MAT B1 form. When you receive this, send it to us and we will calculate if your nanny qualifies for Statutory Maternity Pay. You then send your employee a letter to confirm that they do, or do not qualify and confirmation of leave dates. If your nanny tells you they are pregnant, do not panic. Get in touch with us and we will be happy to assist you.